I was originally going to do a gothic style tartan design but at the last minute decided to change it to the argyle as I feel it would convey the same 90s feel whilst being something a little different. I started off these nails with a base of You Only Live Twice. It's a great pink/red shimmer and I have forgotten how much I love O.P.I nail polish brushes. The application was really easy and every nail took two coats. This shade is AMAZING in the sun, even when covered in this sort of design. 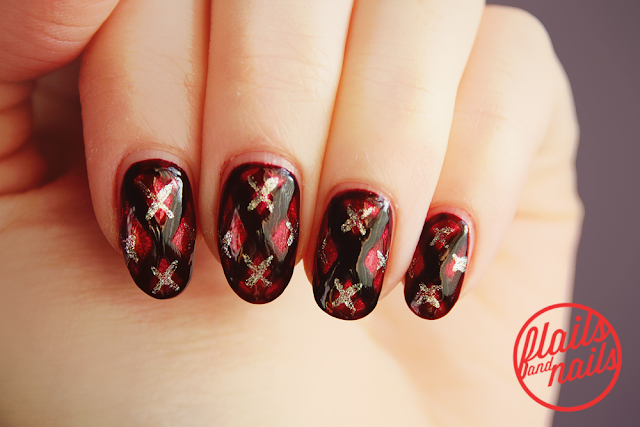 Next, I made a large X across the nail with a striper brush using Barry M's Red Black. It's a jelly shade so a lot is needed to create this opacity so this can take some time. 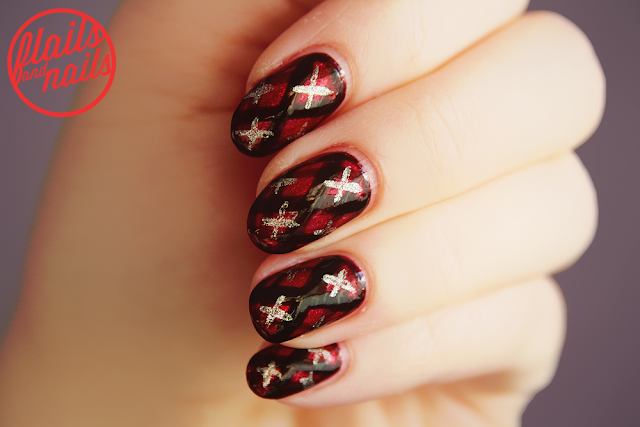 You can use a creme at this point if you prefer and save Red Black or another jelly shade for a few steps ahead. Now, outline the nail using the striper brush and continue using Red Black. 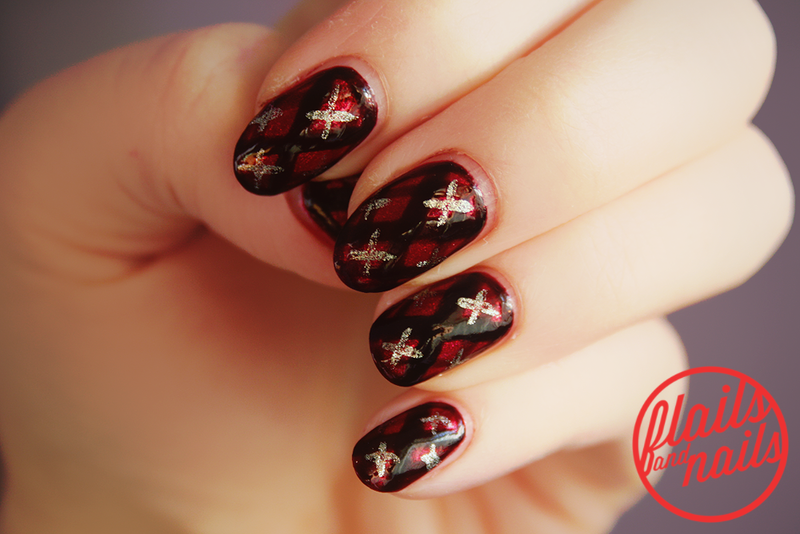 Once completed, make a diamond shape which overlaps the main X on the nail. The jelly consistency of the polish helps create the effect of a faded thread which is quite cool so you need only go over the nail once to create this translucent effect. To finish, draw Xs in the gaps between the X and the diamond, using Her Royal Shineness. You can also do an X in the middle of the nail but I did not as I made my Xs a little too big for it to look nice in this design. 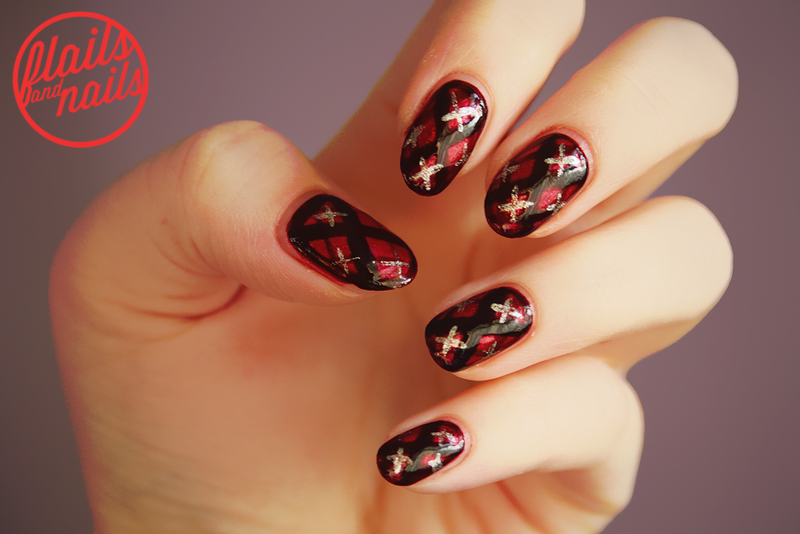 I hope you like the nail art and let me know if you try out this design in any other colours, just let me know in the comments below or on any other social network by tagging @flailsandnails or #flailsandnails, until next time! I think they look christmassy too, very nice! I really like patterns like these right now :) Very pretty!